"Access Windows Live Hotmail or Office Live Mail from Outlook"
Microsoft Office Outlook Connector gives you the great possibility of using the famous Outlook 2003 or Outlook 2007 to easily manage and access your Office Live Mail or Windows Live Hotmail accounts with the benefit of including contacts and e-mail messages. In case of tasks, calendars and notes synchronization, compatibility will depend on the type of service you are subscribed to. With this great Microsoft Office Outlook Connector you will be able to use your Live Hotmail accounts within the intuitive interface of Outlook. You can read and send e-mail messages from Windows Live Hotmail. Besides of possessing advance options to block junk e-mail messages, it allows for the reading and sending of e-mails, and has a very clear contact managing system. 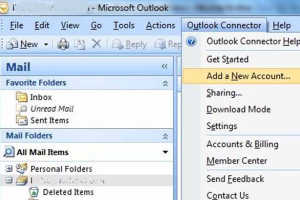 In fact Microsoft Office Outlook Connector lets you take care of multiple e-mail accounts at once, just using one screen to access all the mailaccounts you want to control.